The Spanish international has already been ruled out for 10 months since suffering an Achilles injury during a Champions League game against Ludogorets. Cazorla joined the Gunners in 2012. ARSENAL SUPPORTERS WERE dealt another blow this week as Spanish playmaker Santi Cazorla was left out of the Gunners’ 25-man squad for the first half of the new Premier League season. 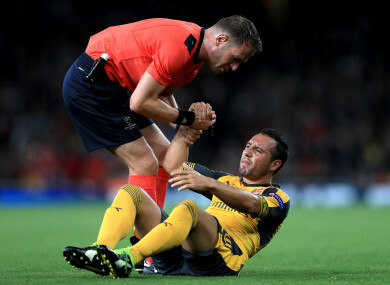 Cazorla has been ruled out for close to a year already following an Achilles injury suffered during a Champions League game against Ludogorets in October 2016. The player made just eight appearances last season and won’t return until at least 2018, when the club can reassess his fitness and select another squad for the second half of the campaign. Arsenal are under pressure this season following poor results in August, losing two of their opening three Premier League games, including a 4-0 defeat to Liverpool at Anfield last weekend. Manager Arsene Wenger has already seen his options reduced with the departures of Alex Oxlade-Chamberlain, Kieran Gibbs and Gabriel Paulista among six departures during the transfer window. Wenger failed to land Monaco’s Thomas Lemar despite persistent interest, but did hold on to forward Alexis Sanchez, with the Chilean included in the Gunners’ finalised 25-man squad which also features Jack Wilshere. Cazorla joined the London club from Malaga in 2012, winning two FA Cups and two Community Shields. The player has undergone eight different surgeries since picking up his injury. In May he expressed his hoped to return within five months. However the 32-year-old will remain on the sidelines until at least the New Year. Email “Santi Cazorla left out of Arsenal's 25-man Premier League squad ahead of 2018 return”. Feedback on “Santi Cazorla left out of Arsenal's 25-man Premier League squad ahead of 2018 return”.